Last year, I didn’t have a working computer for two months. Hurricane Irene came through in August, which took out the electricity for a day and a half. I kept my computer on all the time because if the power cut out for more than an hour, it would take popping the power switch on and off for a long time before it came on. So after the power came back on, no computer. This was very bad, and not just because I couldn’t get online. My money’s always funny, so I couldn’t get it fixed or a new computer. Because of the lazy way I back up my files, only the oldest and the near newest files had ever gotten copied to the external drive (which is still working). That includes a huge file of images I’ve collected over years for photomanipulation work. All of my finished fan fiction work is online somewhere, either in archives or on my own website. But the drafts–mostly gone. Or ostensibly gone. The problem with the computer could be something like a busted power supply, which can be replaced. If it’s the hard drive, then all bets are off. Now I’m using my sister’s old iMac, which is kind of weird. I’m scared to install new software, even though she said I could download and install what I want to. 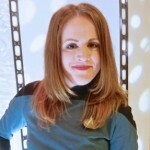 Originally posed at Intrepid Trek. kes7 on Can’t We All Just Get Along? © 2019 Docking Bay #94.